Tracking eCommerce sales is relatively easy with all of the built-in analytics that retailers have access to. Tracking these data points has always been more difficult for brick and mortar stores… until now, that is. With heat mapping, you can optimize your retail store to maximize sales. Thanks to heat mapping, you can easily gain priceless insights into customer behaviors within your store to drive sales. The benefits are tremendous—see how customers shop and where they spend their time in your store, identify which areas they linger in, and then use all of that information to improve your store’s layout and setup. Heat mapping technology tracks movement in real time, using video from cameras combined with analytics software. Together, these two pieces of technology create charts of people’s movements. You can see where your customers are walking, and which areas of the store they linger as they browse products. The technology is also useful for identifying dead areas and bottlenecks. Like other video technologies, heat mapping is entirely scalable and can often be integrated with the products and services that you’re already using. Since it’s part of your IP network, the data can also be accessed remotely. Heat mapping is an incredibly useful way to learn where in your store customers most likely to buy products. The benefits don’t end there, though. Heat maps aggregate data about foot traffic to show you how customers move around your store. Once you’ve used the software in conjunction with your video technology, a heat map can be produced. The map will show colors on the floor that correspond to the foot traffic in an area over a certain timeframe: red areas saw a large amount of traffic, green areas experienced lower traffic, and blue areas mean that spot didn’t receive much foot traffic. Using this information from a heat map, you can easily revamp your store’s layout. Consider placing items with higher profit margins in heavily trafficked areas, for example. You could also use your store’s heat maps to determine where more customer support is needed. Heat mapping can also help you see whether there are any prominent bottlenecks inside of your store, including long lines and wait times. Some retail establishments are using data from heat maps to make shoppers’ holiday experiences less frustrating. In certain malls, a virtual Santa queue is being tested, where shoppers can register their phones and be pinged when it’s their turn with Santa. How did this plan come about? Heat mapping data showed that some shoppers had to wait in line for 2.5 hours for a photo with Santa. Research has proven that customers who touch an item are more likely to purchase it. Again, the colors of the heat map correspond with how long people spent in front of a particular item. Use information about browse time to determine where items are placed—something that isn’t browsed very often could be moved to a less prominent location. Conversely, many people may be browsing an item, but not buying it. That could indicate a pricing problem. 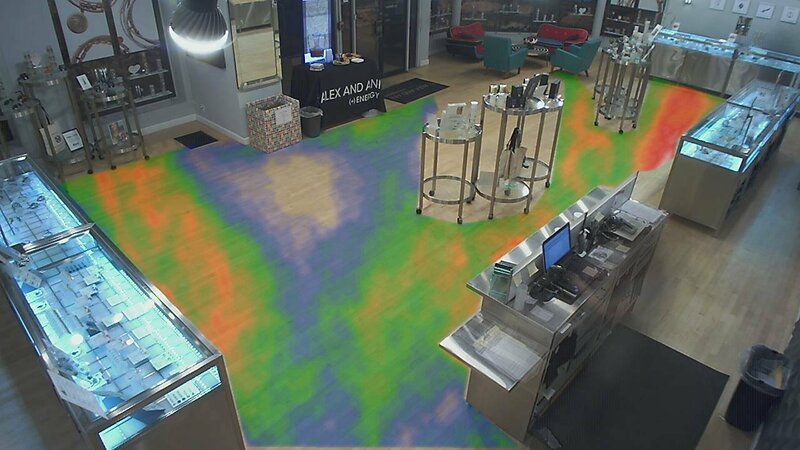 Heat mapping technology can give you access to tons of information about customer behavior within your store. And, even though retail giants like Ikea use heat maps to learn more about purchasing behaviors, the technology is accessible to retailers of all sizes.